Shaw, A. (1915). 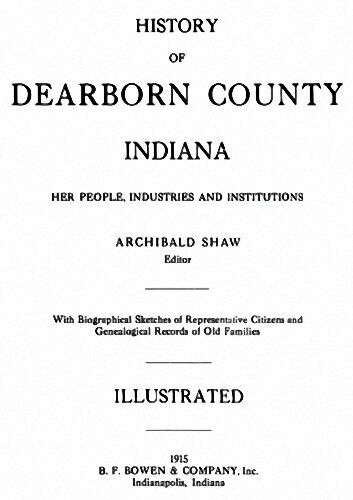 History of Dearborn County, Indiana: Her people, industries and institutions: With biographical sketches of representative citizens and genealogical records of old families (Vol. 2). Indianapolis, IN: B.F. Bowen. ​History of Dearborn, Ohio and Switzerland Counties, Indiana: From their earliest settlement, containing a history of the counties, their cities, townships, towns, villages, schools, and churches ... biographies ... history of the North-west Territory, the State of Indiana, and the Indians (Vol. 2). (1885). Chicago, IL: Weakley, Harraman &.